Giving Nature a Home in Glasgow Full line up of events for Glasgow Wildfest 2017! We’re proud to announce the full line up of events for Glasgow Wildfest 2017! The leaflet is on its way to the printers right now, but you can download an electronic version at the end of this blog, so you don’t have to wait to find out what’s on. This is our fourth annual Wildfest, a whole month of events celebrating Glasgow’s greenspaces and the many organisations and groups working tirelessly to help wildlife and improve their local parks and gardens for everyone to enjoy. This year, there are 32 events for you to choose from, starting on September 1, and spread out at venues throughout the city. Each weekend will see the focus switch to a different part of Glasgow, celebrating both well-known and hidden greenspaces within those areas. Highlights for the festival this year include the grand opening of a newly developed garden and community hub by Friends of Springburn Park (Sept 23) and a picnic concert at the Hidden Gardens with the accompaniment of live chamber music (Sept 16). We’re also looking forward to the Wild Day Out in Glasgow’s Botanic Gardens (Sept 2), which will be the biggest recording event there in 20 years! Please do join us for that if you can, as we need as many citizen scientists as possible on the day to help us uncover all the wildlife. The incredible artwork for this year’s leaflet is an ink and water colour sketch by artist Stuart Hatt. 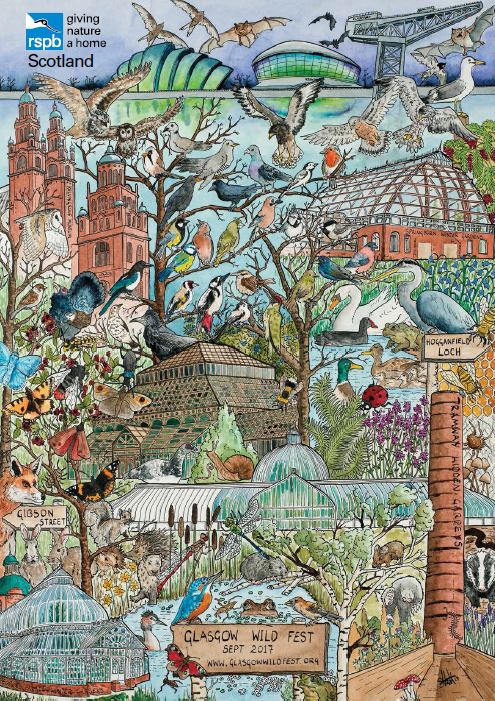 Stuart has produced the most detailed drawing we’ve ever had on our leaflet, with scientifically accurate depictions of both iconic Scottish species, and wildlife you’ll see within Glasgow itself. We’ll have more on Stuart and his work in an upcoming blog, so stay tuned! If you have any questions, or would be interested in volunteering during the festival, just get in touch gnahg@rspb.org.uk.